My first review here at DVD Collector's, so be nice! After getting off to a somewhat slow start, this spy/thriller heats up quickly after the first ten or fifteen minutes and never stops ‘til you get to the end. There are plenty of twists and turns, and a plot that is refreshingly unpredictable as well as one or two relative shockers. 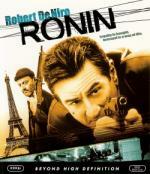 De Niro and Reno are excellent as always and develop a bond right from the start. Although McElhone is a beauty, I just didn’t feel she was the best choice for the Deirdre character. I thought that the cinematography of this film was excellent with some really stunning settings in various European locations. This was a fun, action-filled, well acted film that I thoroughly enjoyed. I still want to know what was in the damn case! That car chase, especially the bit where there go against traffic, is one of the most exciting ones I have ever seen. great little flick, Frankenheimer showing the youngsters how it's done. Absolutely. That really took some phenomenal choreography! Thank you for this excellent review, Hal! A must have IMHO! Long time ago, I've watched it on dvd... I will think about a blu-ray upgrade. The review at blu-ray.com indicates that the video transfer is not reference material. Even worse, no Extras at all. Since my original-release DVD has an alternate ending and a commentary I will hold on to that until Fox/MGM decide to give us a proper Blu-ray. NOTE: People are speaking out against this title making a solid point that the majors won't get the point unless we are vehement in our dismissal. I believe they are right. Our recommendation is to own the Criterion DVD until this title is transferred correctly in the new format.